Brandon is making more than guitar cabinets. He’s making pieces of art. When I opened the box after delivery, I could not believe how well built it was and how the finish just looks incredible. Brandon is also an extremely easy guy to work with and super responsive. Give him a shot if you need a new cab. He’s the real deal. B Custom Cabs rocks. Brandon is an amazing builder and creates not only some of the best looking, but best sounding guitar cabinets I have ever used. 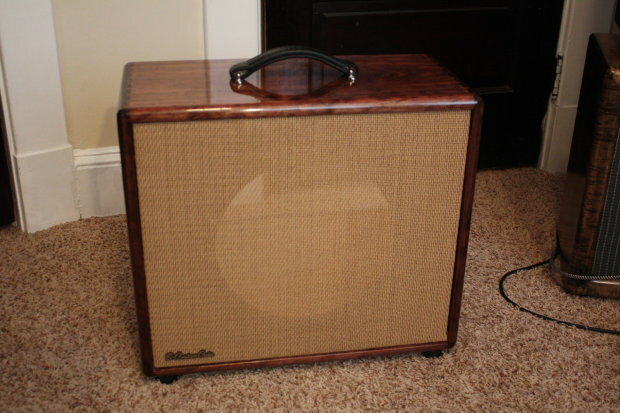 I have had a handful of guitar cabinets and guitar amp heads built and I’m happier and more amazed with each one. My fender tweed champ 5F1 chasis needed a good home. It was my first build so you know I wanted something prestine. Well I couldn’t have asked for anything better! It is a thing o beauty. I highly recommend Brandon and B Custom Cabs to anyone looking or a custom hardwood guitar speaker cabinet or amplifier head shell. You will not be disappointed, you’ll be amazed! Some years back I purchased an beautiful open back speaker cabinet on Ebay. It was flamed maple through and through, with a lush orange stain and shiny finish… a real handsome piece of woodwork. But recently I went stereo with a Swart amp, which meant I needed a second cabinet to get that deep stereo effect. So, I went looking for that vendor on Ebay to buy a second cabinet, and he was gone without a trace. I then examined the various other cabinetmakers available on the site and found just a few whose work had a similar fine finished look. Then I wrote to all of them explaining what I was looking for, and I didn’t expect it would be easy. Of the couple who even replied, Brandon was thoroughly positive, asked the right questions, and even had the right answers… so I went with him. As you can see from the pix I shot, he got it down! And it’s uniquely beautiful on its own, even as it’s a near perfect match for my original piece in a very yin/yang way. He was consistently pleasant in all our exchanges, contributing whatever was needed as we worked through all the particulars – most notably, getting the color right. He did the work as scheduled, sending shop photos throughout. Packed and shipped it with great care. Truthfully, with it’s dramatic, glassy blue finish, its often the first thing people notice when I get visitors in my music room.